Pi Die is a Rasberry Pi powered die. Give it a shake, and the die displays a random number from one to six. The number is displayed in a traditional die pattern using seven green LED's. 7 x 5 mm green LED's. 7 x 180 ohm resistor. Cardboard from a cereal box or similar. Glue the template to the cereal box. Note the push button is actually the tilt switch. I didn't have a symbol for the tilt switch. You should have seven LED's like this. Fit the LED's into the holes in the cardboard. some of them aren't quite long enough, so you'll need bridge the gap with some wire. Glue them into place using hot melt glue. Next, solder the switch and resistors in place. One lead of the switch is connected to ground (negative) the other lead is connected to both the 10K resistor and the 1K resistor. 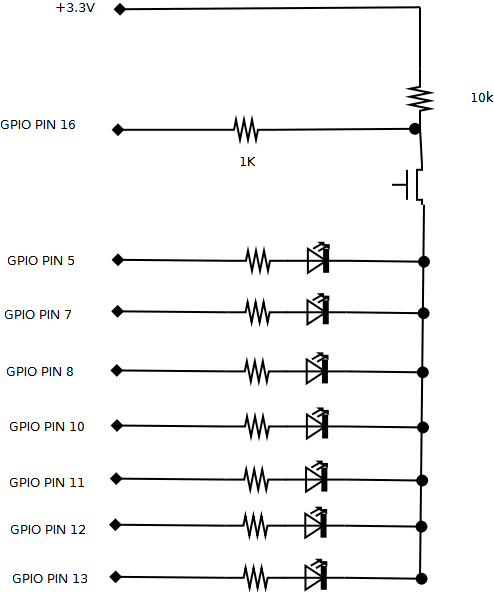 The 10K resistor is to float the GPIO pin high. The 1K resistor stops the switch from shorting out the GPIO pin, killing the pi. Now to connect it all up. Make notes of which wires are connected to which LED's / switches and connect them to the appropriate GPIO pins.